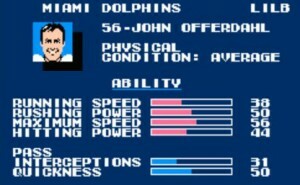 John Offerdahl was a legendary Tecmo Bowl player on the Nintendo. 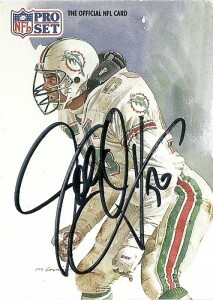 The Dolphins could light up the sky with Dan Marino but outside of Offerdahl, the team had a very weak defense. The other problem was, most offenses were set up to have run plays that never allowed John to get free, thus you had to break through the blockers on run plays to get to the runningback. 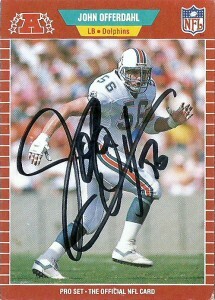 A tackling machine at Western Michigan University, John Offerdahl would be selected in the second round (57th pick) of the 1986 draft by Don Shula‘s Dolphins. He’d step right into the starting lineup for the team, starting 15 games, 2 sacks and a pick, and a bazillion tackles. He’d be a lock for the ProBowl over the next 5 seasons recognized across the league for his solid tackling, nose for the ball, and flexibility to play all 4 positions at linebacker in the 3-4. His 1990 would culminate in being named All Pro after the season, however injuries over the next 3 seasons would limit his mobility and by 1994, he would retire. It’s probably not going to happen for John and the Hall of Fame even if he hadn’t had such an injury plagued finale- strictly because he was a tackling machine. As efficient as he was, tackles are such an unglamorous statistic, and with a long line of defensive talent and sack masters waiting- I doubt John will ever receive his due. John since retirement is quite a businessman and cook, owning a series of cafe’s (Offerdahl’s Cafe & Grill) and while selling his bagel franchises. He’s also quite a popular personality on the ‘grilling circuit’ as well going by “The Gridiron Griller!” (www.gridirongriller.com) It probably is only a matter of time before he shows up on Food Network.